Lunch was over and we were part way through the presentations when we got a call for “everyone to take their seats.” There was general hubbub around the door, and Martha Stewart appeared, looking fabulous in jeans, apron and fancy boots. Of course no one took their seats, but instead rushed towards the blinding light of Martha. She really did look lovely by the way. And how amazing is it for a person to look poised and friendly when swarms of people are pointing at you with their cameras, while looking at you with open-jawed amazement. She simply said, “I heard there was a gathering of garden writers here, and couldn’t let the opportunity pass, I had to come and say hello to all of you.” She stood there for a while and posed for pictures with Garden Writer organizers, while we looked on with goofy smiles on our faces. I was a little bit in the back and did hold my camera up and did get that perfect snapshot of the top of Martha’s head. I must add that Martha, while not only looking elegant and surprisingly down to earth, gave off quite a positive energy. She seemed…well, like a nice lady, and it was lovely of her to pop in and say hello to us. 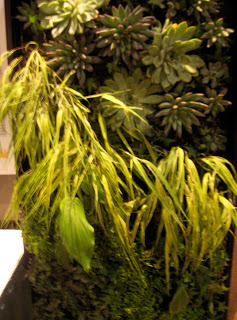 Martha’s picture of this green wall panel, shown on her blog, is much nicer than this one I took. Plus, hers is in focus. 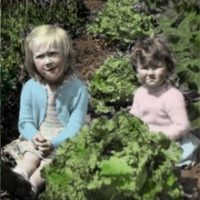 A week has passed, and I accidentally stumbled onto Martha’s blog. She had done a little blurb about Canada Blooms, with a slide show. The main focus for her appearance at the show was her launch of garden tools and furniture for Home Depot. I was flicking through her pics of the products and the show, noticing that a couple of the pics were of crowds pointing Martha-ward with cameras. I guess she has a sense of humour about her own fame. Now here’s the part that made me jump and utter an involuntary yip. You may remember my recent post of my experience at Canada Blooms as a set-up volunteer. I wrote about a green wall panel that I and another volunteer, Jackie, assembled. (Should mention here that the panel and entire exhibit I worked on was designed by Michelle Reid, City of Toronto horticulturalist.) Our panel contained mostly top-heavy echeveria and grasses that were bigger than we would have liked. Well, lo and behold, there was our wall panel in Martha’s Canada Blooms slide show! You coulda knocked me over with a feather (of which there were many at Canada Blooms 2010). If I’d known that Martha was going to be seeing it and adding its picture to her blog I’m thinking it would have been even harder to get those roots to go into those teeny little pockets. I couldn’t have taken the pressure! Hi Sarah – okay, I'm officially jealous – meeting Martha has always been a dream of mine. I call her my idol/nemesis – I think I love/hate her. And congratulations on the green wall – it was amazing and obviously Martha thought so too. Congratulations on your brush with fame. How thrilling! Martha was right to choose your living wall. It's a great idea with a unique presentation. Very cool, and I am duly impressed!